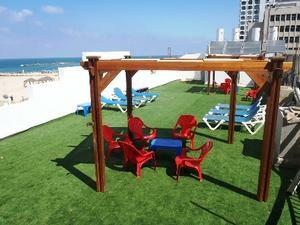 The Beachfront Hotel is Located on the famous Tel-Aviv Promenade, Herbert Samuel over looking the famous beaches of Tel-Aviv. the most lively and vibrant part of the city. Our location makes it possible to reach almost anything a tourists heart desires to see in a short time. Beachfront is a brand new, modern hotel offering cheap accommodation on the beach The two story building offers a variety of rooms accommodating any travel budget. Our guests enjoy a full Breakfast for just $7 at the famous “Yotveta” restaurant next door and a variety of discounts at restaurants near by such as a 20% discount at the popular 'La Mer' beach restaurant just across the promenade. Our friendly staff will be happy to help you with finding pubs, clubs, book tours, connect you to water sports opportunities and other hot spots in Tel Aviv! 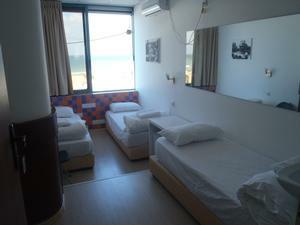 Beach Front has 2 types of rooms,private en suite rooms and rooms with shared bathrooms and showers. 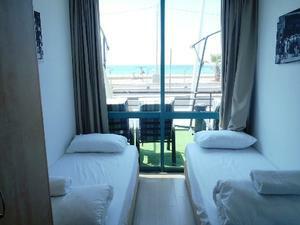 MOST ROOMS ARE WITH A SEA VIEW AND/OR BALCONY! Number of rooms 32. Comfortable rooms with self controlled air-condition, 32 inch flat screen cable TV and free WI-Fi Internet connection. A huge roof with Game room and lounge area great for sun-bathing and soaking up the sun and amazing sea view. Unlimited supply of beach towels , free hot/cold drinks complementary throughout the day. By train: From the airport you can take a direct train from inside the terminal to the Arlozorov Station in Tel-Aviv. Then bus # 63 to Ben Yehuda st corner of Trumpeldor, walk down Tumpeldor for 2 minutes towards the Beach to the Hotel. By Car: drive to tel Aviv beach, Ha Yarkon street , going south towards Jaffa until you reach Herbert Samuel st, pass the American embassy on your left and proceed to the adjacent parking lot next to it. The hotel is right next door. By Taxi: Ask the driver to go to Herbert Samuel 78, next to the American embassy. Please include Taxi fare. From the air port Taxi fare is approximately 130 - 160 ILS, any were else always ask the driver to put the meter on.